1227 Pasteur Drive, Lancaster, CA.| MLS# SR18194874 | Southern California Homes for Sale. Search properties Southern California. 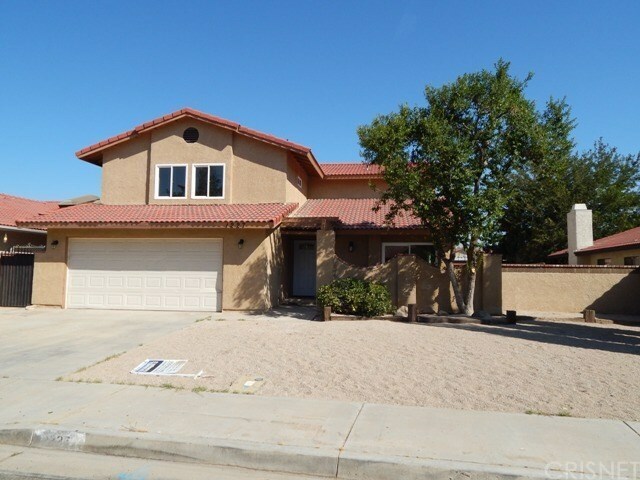 Fully Renovated Two Story Home located on cul de sac street. This two tone paint scheme through out the interior. From the entry way there is dark wood type flooring. Step down into giant living room and attached dining area. the kitchen is open to family room. Kitchen cabinetry and counter tops are new, tile flooring (appliances will be installed) prior to COE. New windows through out. Downstairs room could be office or 5th bedroom? Down stairs half bathroom. Family room with fireplace and flag stone fireplace hearth and mantel. Indoor laundry. Upstairs there are (4) Bedrooms. Two of the bedrooms have attached bathrooms. There are two additional bedrooms plus hallway bathroom. Master bedroom has large walk in closet. The master bathroom has raised double sinks and shower with enclosure.